For this project, we are going to make a buzzer produce a warbling sound. What does it mean to warble? According to dictionary.com, warble means to produce a continuous sound varying regularly in pitch and frequency. So basically, it means the tone that the buzzer produces is always varying and is never steady. So this is what we're going to do for this project: make a buzzer produce a tone that is constantly varying. This circuit works by using a capacitor to give power to the buzzer. A capacitor is first charged and then once the main voltage source of the circuit, which in this case is a battery, is removed, the capacitor acts as the power source for the buzzer. A capacitor, once fully charged, is loaded with full voltage. However, once it begins discharging, its voltage supply becomes less and less and less. 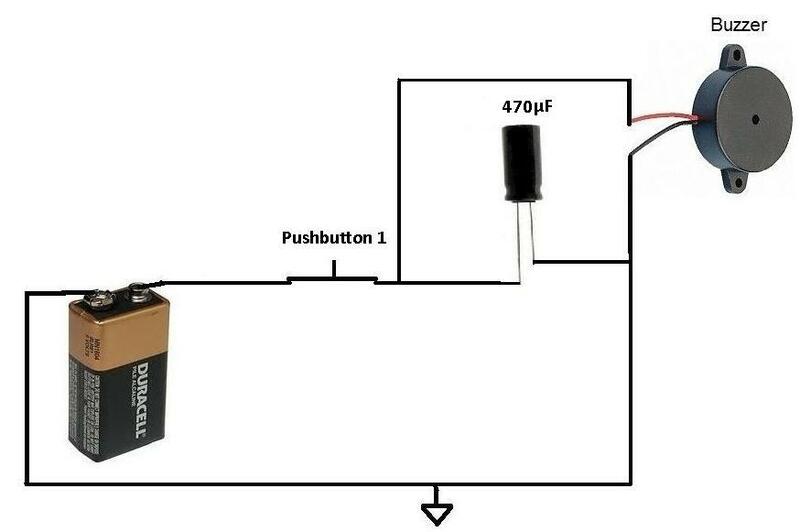 Because the capacitor supplies these different voltage levels to the buzzer, it produces different pitches in the buzzer. As the buzzer gets less voltage, the pitch of the buzzer rises. Push down the pushbutton and hold it down. The buzzer will emit a steady tone. This is because the 9-volt battery is supplying it a steady voltage while at the same time charging the capacitor. Now if you release the pushbutton, the sound will rapidly rise in pitch and then cease altogether. This again is because the capacitor is now supplying power to the buzzer and it discharges its voltage quickly. Now to create the warbling sound, press down the pushbutton in rapid succession. The buzzer will not make a steady stone because it is not receiving constant voltage from the battery. That along with the fact that the capacitor charges up and discharges varying voltage allows for the wavering, warbling sound. Try it! To see another capacitor circuit, visit How to Apply a Pulse to a Speaker Using a Capacitor.